I’ve been dying to start on my new Chanel moisturiser but have been very restrained and forced myself to use up all of the product I already had on the go. It helped that this was a very nice Clarins cream that I was getting along rather well with -- and that there wasn’t too much left in the tub. 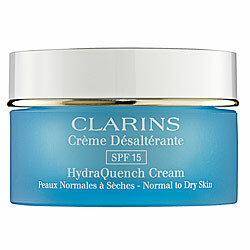 I’d been using the Clarins HydraQuench Cream with SPF 15 for the last 3 and-a-bit months so it’s had good innings. It comes in a pretty, blue-glass jar which looks nice on the bathroom shelf . Mine was a gift, so I’m not too sure of the price here in Dublin, but it’s £32 for 50 ml on the Clarins website -- which describes the product as a “climate-control day cream with super-moisturising Katafray bark extract and UV protection”. The version I had was for normal to dry skin but it comes in several different formulations: the range also includes a lotion, a rich cream and a cooling cream-gel. I actually have normal to combination skin, prone to the occasional dry patch on my cheeks and slight oiliness in the t-zone, but the normal-to-dry variety suited me perfectly. It’s a fairly thick white cream that seemed to balance out my skin, felt light on application and absorbed well, leaving my skin soft and supple. There’s no greasiness so it’s a good base for make-up and I experienced no dry patches or breakouts while using the product. Over the past month though, what with various illnesses, a bout of insomnia and the onset of the colder weather, I’ve noticed a loss in radiance and my skin has looked dull and tired. I added a few lotions and potions into the mix which I’ll write about soon, but my skin has still been crying out for something a little bit richer. 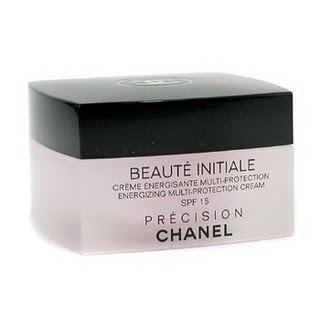 And so, like the fickle consumer that I am, this week I have fallen for another (she can make her own way home): the beautiful – but wordy -- Chanel Precision Beaute Initiale Energising Multi Protection Cream. I’ll give it some time and then let you know how we’re getting on. But what about you? Have you used either of these products, and how did you find them? And will you be switching your loyalties for the colder winter months? I knew you were getting the Beaute Initiale and was curious to know how you got on. I might try it myself. I was using the Ultra Lift one and found it great, really noticed a difference. I'm using Dermalogica at the moment after availing of discount prices at that Buff Day Spa gig I told you about and really liking it. I think I might try this when that's gone though depending on how you find it. These are both a bit rich for me and I don't mean the formulation!! The main job for a moisturiser is hydrating your skin and the drugstore brands can do that just as well as the pricier versions where most of your money is going on branding and packaging etc. I am currently working off Simple's Kind To Skin Refreshing Facial Wash Gel, Cover Fx Primer, Garnier's Anti-Wrinkle Firming Day Cream SPF 15 [a very budget friendly €4.99 from Rossman in Berlin] and the wonderful Eve Lom Eye-Lift cream [freebie!]. When Eve Lom eventually runs out, i'll be back to the Nivea Visage Anti-Shadow Eyecream. Cheap and cheerful, but it works!